There's something about the way this author writes (which is fantastically) and how she creates characters (which is wonderfully) that I just find to be really compelling. I may not love her books, but they're certainly good books, and they feature stories that are hard to resist. And because of all that, I am very much looking forward to this character-fueled, adventure-run sequel. Is your pick this week a sequel? I reaaaaaally need to read this series, or anything by Victoria Schwab. Great pick! I haven't read any of Victoria Schwab's books but have only heard great things about them. This is definitely being added to the list of must reads :) Great pick! i have a *GREAT* need for this to be out right now! 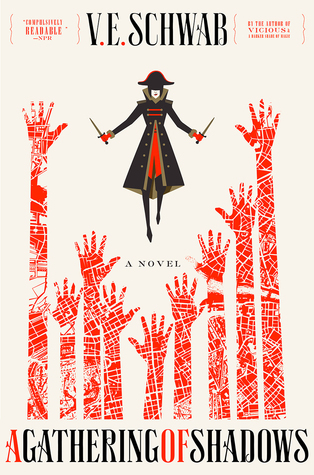 I loved ADSOM so much, and this one looks so amazing as well (that cover!!) i hope you love it! I still need to read ADSOM. It's been on my list, I just didn't get to it yet. I think I need to put that at the top of my TBR so that I can be ready for this one. LOVE Victoria Shwab and these covers are so cool. Great pick! I really need to read the first book! I've heard such amazing things about it. I have a little time before the sequel. Great pick! My God YES. I don't want this series to end! !